Working through its Bangkok-based subsidiary, Logistics Bureau Asia, Logistics Bureau Pty Limited, has completed a deal with Vinafco Joint Stock Corporation of Hanoi to provide consultancy services in the fields of Logistics and Supply Chain Management. 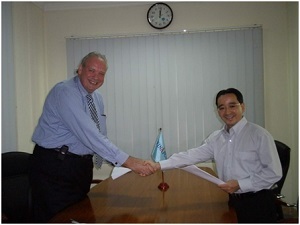 The photograph shows Mr. Trinh Ngoc Hien, the Chairman and CEO of Vinafco and Mr. Colin Airdrie, Managing Director of Logistics Bureau Asia exchanging signed copies of the contract in the Vinafco offices in Hanoi. Vinafco was established in 1987 and since July 2006 has been listed in Ho Chi Minh City Stock Exchange. The corporate headquarters are in Hanoi with branches and representative offices located in Lang Son, Hai Phong, Bac Ninh, Vinh, Da Nang, Nha Trang, Qui Nhon, Ho Chi Minh City. Logistics Bureau has been engaged to assist Vinafco in developing a growth strategy for the next five years.